Numinex was a fearsome dragon famous for his battle with Olaf One-Eye in the First Era, which occurred some time before 1E 420 when Olaf became High King and ended the War of Succession. A few ancient bard texts assert Numinex was particularly foul-tempered because he was extremely old. In these accounts, the dragon spends his final years terrorizing the countryside before flying off to the top of Mount Anthor to die in peace, but was interrupted by the opportunistic Olaf. This version of the story is questionable however, as dragons do not actually die of old age. Regardless, Numinex had wiped out entire villages, burned cities and killed countless Nords. Along with a few trusted warriors, Olaf confronted and fought Numinex at his lair atop Mount Anthor. The two battled, blade against claw, by some accounts for days. Eventually, their battle incorporated the thu'um, and the two engaged in an epic shouting duel. Finally, Numinex collapsed from a combination of injury and sheer exhaustion. Somehow—and this detail is conspicuously absent in virtually every account—Olaf managed to convey the dragon all the way back to the capital city of Whiterun. By Olaf's decree, the city's keep was renovated to become a prison for Numinex. Since then, the great keep has been called "Dragonsreach". Numinex was apparently driven half-mad by many, many years of loneliness and captivity, though Paarthurnax would manage to visit him from time to time. 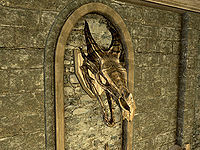 While it is claimed Numinex eventually escaped, his skull can still be seen hanging above the Jarl's throne at Dragonsreach. Due to the nature of dragons, Numinex is not truly dead and could be raised again, although his scattered remains make this an unlikely possibility. ^ a b c Proventus Avenicci's dialogue in Skyrim. ^ Commemorative plaque in Windhelm. ^ a b c Paarthurnax's dialogue in Skyrim. ^ Viarmo's dialogue in Skyrim.